Lenín Moreno: "Assange lied to obtain Ecuadoran nationality"
In an exclusive interview with Univision's Patricia Janiot, the president of Ecuador listed the reasons why his government decided to withdraw the political asylum granted to the founder of Wikileaks, and accused him of plotting with former president Rafael Correa. 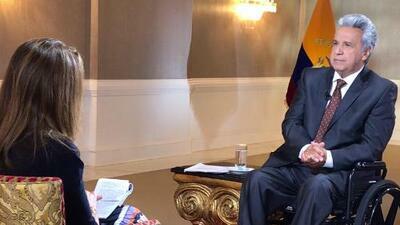 In an exclusive interview with Patricia Janiot, the president of Ecuador, Lenin Moreno, said the decision to terminate the political asylum of Australian hacker Julian Assange was the result of an accumulation of factors, including intervening in the politics of other states, disrespect for Ecuador in his public comments and lying to obtain Ecuadoran citizenship. "The issue of Mr. Assange became untenable, that is why we decided to terminate the diplomatic asylum we had granted him," Moreno said. "Everyone knows that Mr. Assange permanently violated the silence that must (be kept) mainly with respect to politics," he added, referring to the norms for granting political asylum in an embassy residence. "He had a team of hackers, like him, who were permanently violating the secrets of countries, intervening in issues such as the U.S. elections, the Vatican and the Catalan independence issue," Moreno said. According to the Ecuadoran government, after Assange took refuge in its London embassy in 2012 he received visits from people who helped him carry out attacks against the governments of the United States, Spain and Ecuador. Among them were a Swedish citizen and two Russians currently detained and under investigated by judicial authorities in Ecuador. Moreno also said that Assange acted in bad faith to obtain Ecuadorian citizenship and protection: "The citizenship was delivered based on false information ... Mr. Assange lied in regards to the requirements to achieve citizenship," he said. The Ecuadorian president dismissed accounts that attributed the decision to personal revenge after Assange and his team allegedly hacked the phones of Moreno and his wife, distributing photos showing the president during trips and dining. According to Moreno, this was the least important of the alleged attacks by Assange against his government. "We have received 40 million cyber-attacks by the teams linked to him: (...) to state entities, financial entities and government," said Moreno. Moreno believes that his former political ally, Ecuadoran ex-president Rafael Correa, is linked to Assange’s alleged plot: "He (Correa) is behind all this (...) Ecuador's justice system has almost reached a verdict with respect to all the acts of corruption that he committed, to such an extent that he is a fugitive from justice and is roaming internationally (...) He’s the one who betrayed Ecuador, with a whole web of corruption that deprived the state without billions of dollars, either due to corruption or in badly done pharaonic works," the president concluded.